One of the amazing benefits of loving baking and cooking is that when you crave a specific ingredient you can find so many alternatives ways of using it to create the perfect treat! In a bowl we mix the dry ingredients with the vanilla essence and the orange juice. The aim is to get a sticky dough we can work. If needed we add more water. We form small balls and put them in the fridge for half an hour. Once out of the fridge we dip them one by one in the orange curd and put them in the fridge. We melt the dark chocolate in Bain-marie and set it aside to cool for 10 minutes. On our kitchen counter or table we place kitchen foil and on top of it we arrange the balls. 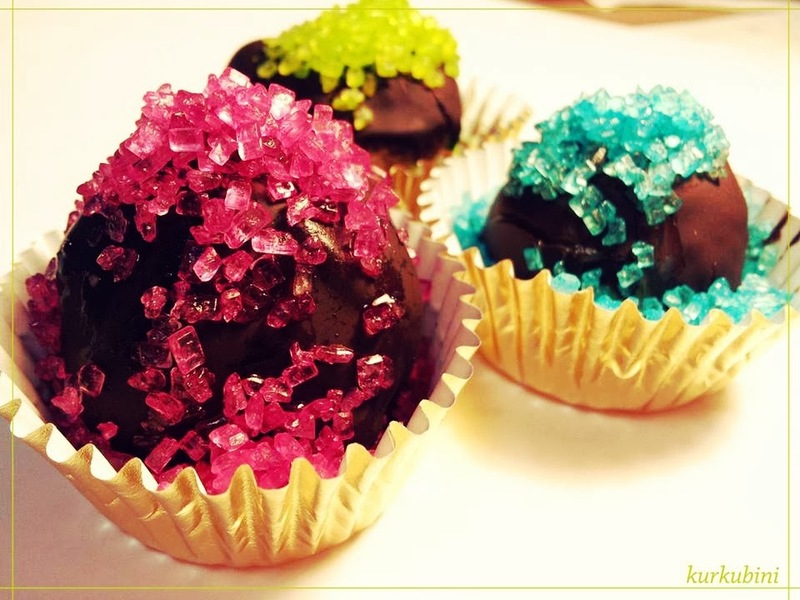 With a spoon we pour chocolate on each ball and then if we want decorate with crystallized decorating sugar or coconut flakes. We place our marzipan chocolates in the fridge and cool for 1 – 2 hours.